U.S. efforts to overturn the government of Syria have now extended into a fifth year. It is increasingly clear that thousands of predictions reported in the corporate media by Western politicians, think tanks, diplomats and generals of a quick overturn and easy destruction of Syrian sovereignty have been overly optimistic, imperialist dreams. But four years of sabotage, bombings, assassinations and a mercenary invasion of more than 20,000 fighters recruited from over 60 countries have spread great ruin and loss of life. The U.S. State Department has once again made its arrogant demand that Syrian President Bashar al-Assad must step down. This demand confirms U.S. imperialism’s determination to overthrow the elected Syrian government. Washington intends to impose the chaos of feuding mercenaries and fanatical militias as seen today in Libya and Iraq. A delegation from the International Action Center headed by former U.S. Attorney General Ramsey Clark traveled to Syria in late February to present a different message. Visits to hospitals, centers for displaced families and meetings with religious leaders, community organizations and government officials conveyed the IAC’s determination to resist the orchestrated efforts of U.S. imperialism acting through its proxies in Turkey, Saudi Arabia, Qatar, Jordan and Israel. The IAC’s opportunity to again visit Syria came following its participation in a packed and well-organized meeting of the International Forum for Justice in Palestine, held in Beirut on Feb. 22 and 23. The conference was initiated by Ma’an Bashour and the Arab International Centre for Communication and Solidarity and again confirmed the centrality of the burning, unresolved issue of Palestine in the region. 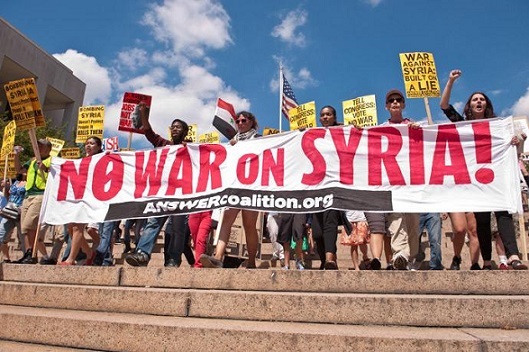 The solidarity delegation to Syria included Cynthia McKinney, former six-term member of the U.S Congress; Lamont Lilly, of the youth organization FIST – Fight Imperialism, Stand Together; Eva Bartlett, from the Syrian Solidarity Movement; and Sara Flounders, IAC co-director. The delegation traveled the rutted, mountainous, blacktop road from Beirut to Damascus to the Lebanon-Syria border. On the Syrian side, this road was a modern, 6-lane highway, a reminder of Syria’s high level of infrastructure development. Even after four years of war, this is still a well-maintained highway. Due to sanctions against Syria, hundreds of trucks attempting deliveries stretched for miles on both sides of the border. Compared to two years ago, when the IAC visited Damascus, this year we didn’t hear the constant thud of incoming rockets from mercenary forces shelling the city. These military forces have been pushed back from their encirclement of the capital. Syrian military units, checkpoints, sandbags, blast walls and concrete blocks were now less pervasive. Markets were full of people and held more produce. A visit to Damascus’ largest hospital showed the cumulative impact of four years of devastation. At the University Hospital, where children with amputated limbs receive treatments in the ICU, many children had been brought in maimed from explosives and with shrapnel wounds from mortars and rockets fired on Damascus by terrorist forces. At a visit to a center for displaced families at a former school, we met with university students, who provide sports, crafts, tutoring and mentoring programs. Medical care, free food and education programs are provided by the centers. But conditions are desperately overcrowded. Each homeless family, often of 6 to 10 people, is allocated a single classroom as housing. Almost half the population has been displaced by the terror tactics of mercenary forces. A theme in almost every discussion was Syria’s heritage as a diverse, rich mosaic of religious and cultural traditions. Sectarian divisions and intolerance are consciously opposed. One can see the determination to oppose the rule of foreign-funded forces. A visit with Syria’s Grand Mufti Ahmad Badr Al-Din Hassoun and Syrian Greek Orthodox Bishop Luca al-Khoury reflected the centuries of religious harmony that previously existed in Syria. Mufti Hassoun stressed the need for reconciliation. He described to the visitors the assassination three years ago of his 22-year-old son, Saria, who “had never carried a weapon in his life.” Saria was gunned down after leaving his university. At the funeral, Mufti Hassoun declared he forgave the gunmen and called on them to lay down their weapons and rejoin Syria. He described his Greek Orthodox counterpart, Bishop Luca al-Khoury, as his cousin and brother. Bishop Khoury described the ease with which he received a visa to the U.S., while Mufti Hassoun was denied a visa, although both are religious leaders. “Why do they differentiate between us?” said Khoury. “It’s part of the project to separate Christians and Muslims here. It’s over gas pipelines which are supposed to run through Syrian territory. This will only happen if there is a weak Syrian state. Political and media adviser to President al-Assad, Dr. Bouthaina Shaaban, described the problem of stopping the weapons and mercenaries flooding into the country: “With external support and financing, and an over 800-kilometer border with Turkey, it’s very difficult to stop the flow of terrorists. The delegation headed by Ramsey Clark also had an important opportunity to meet with Abu Ahmad Fuad, deputy general secretary of the Popular Front for the Liberation of Palestine, and Abu Sami Marwan, of the Political Bureau of the PFLP, and hear of the ongoing developments in Palestine and the region. According to a Feb. 25 statement released by the PFLP after the meeting, “The PFLP leaders discussed the nature of the U.S./Zionist aggression against the people of the region, their intervention in Syria and the attempts of colonial powers to impose their hegemony by force and military aggression, through division of the land and people, and by pushing the region into sectarian or religious conflict. “This U.S. policy is nothing new.” The Front noted that the colonial powers have waged an ongoing war against the Arab people to prevent any real progress for the region on the road to liberation, self-determination and an end to Zionist occupation. “The U.S. delegation discussed the urgent need for building ongoing solidarity with Palestine in the United States and internationally,” continued the release, “in particular to confront the deep involvement of the United States — militarily, politically and financially — in the crimes of the occupier, and to end its attacks on Syria, Iraq and the people of the entire region. “The solidarity delegates noted that there is a colonial scheme to divide and repartition the region according to the interests of major corporations and imperial powers, targeting the resources of the people, sometimes through blatant political interference in the affairs of the region and other times through wars and military attacks on states and peoples. Sara Flounders is Co-Director of the International Action Center (IAC). Lamont Lilly is an organizer with Fight Imperialism Stand Together (FIST) and Workers World Party. Read other articles by Sara Flounders and Lamont Lilly. This article was posted on Monday, March 30th, 2015 at 3:21pm and is filed under Culture, Imperialism, Resistance, Solidarity, Syria, Turkey.